Home > Car Care > When does the transmission pan need to be resealed or replaced? Can you drive with a transmission pan leaking? What to do if a transmission pan is "sweating?" When does a transmission pan need to be resealed and when replaced? Should the transmission filter be replaced whenever the transmission pan is removed? Can you drive with a transmission pan leaking? 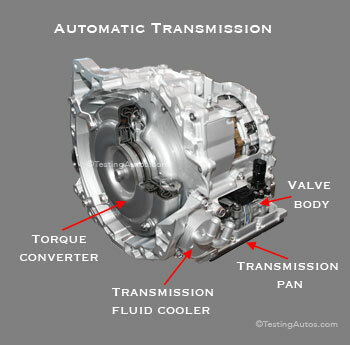 Your transmission needs proper level of transmission fluid to operate. If the fluid level drops below the minimum, the transmission will start slipping and will eventually fail, which is a lot more expensive to repair. If for any reason you cannot repair the leak soon, keep the transmission fluid level topped up. The only problem with this, many modern cars don't have a transmission dipstick. Without a dipstick, checking the fluid level is tricky. Read more: How do mechanics check the fluid level without a transmission dipstick (scroll down towards the middle of the article). What to do if a transmission pan is "sweating?" The term sweating means there is or was a small leak. How small is the leak? Does transmission lose any fluid? If it doesn't and if you don't want to repair it now, then monitor the fluid level, watch out for dripping on your driveway and have your mechanic recheck it at the next service. When does a transmission pan need to be resealed? If a transmission pan leaks, but is otherwise in good shape, it needs to be resealed. 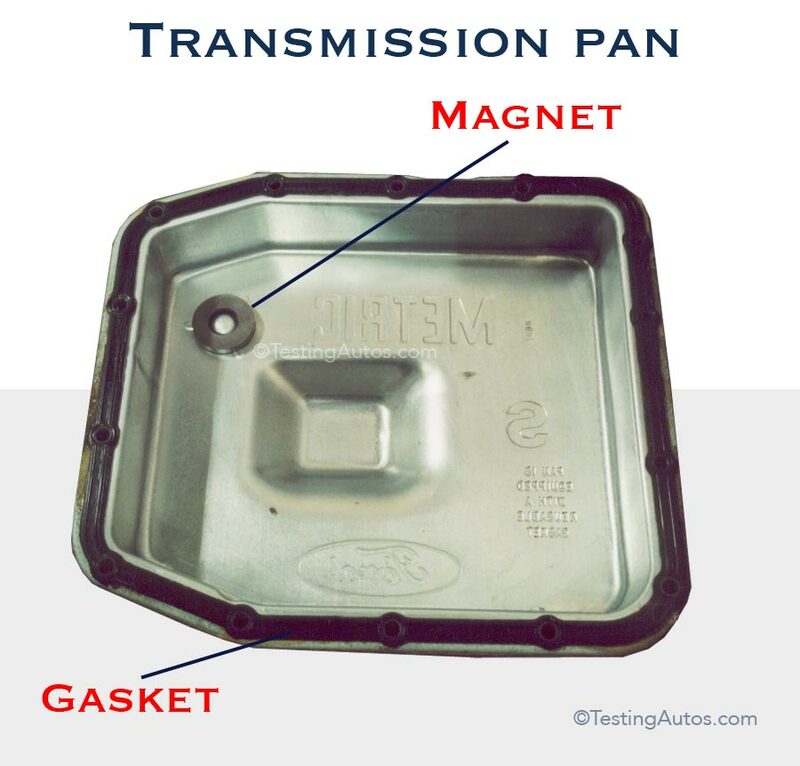 In some cars, a transmission pan has a gasket that needs to be replaced, in others, the pan is sealed with a special sealant (gasket maker). Resealing a transmission pan costs from $50 to $250 labor plus the gasket or sealant ($15-$35), plus, 3-5 quarts of new transmission fluid ($30-$130 depending on the type of fluid). When a transmission pan needs to be replaced? The pan may need to be replaced if it's badly rusted or scraped. It might also need to be replaced if a drain plug tread is damaged or cross-treaded. Replacing a transmission pan costs the same as resealing, plus the cost of a pan ($60-$130). Aftermarket parts are cheaper, the OEM pan is more expensive. Whenever the transmission pan is removed, it will need to be thoroughly cleaned on the inside before installing. The magnet inside the transmission pan is designed to collect metal dust and shavings from the transmission fluid. The old sealant will need to be completely removed. The magnet that collects the metal wear particles also needs to be cleaned from any residue. The pan contacts surface bust be corrected if not completely flat. It's also very important to use only the recommended transmission fluid type. If you are doing the job at an independent repair shop, we recommend to get the proper fluid from your local dealer. Should the transmission filter be replaced whenever the transmission pan is removed? In almost all modern cars, a fine-mesh screen is used instead of a filter. A screen doesn't need to be replaced. If a car has a paper filter or if it's mentioned in the maintenance schedule, then the filter will need to be replaced. Is it easy to replace or reseal a transmission pan DIY? It's not very difficult but this job is messy, as the transmission fluid will keep dripping for long time when the pan is removed. If you spill the fluid in your garage, it will smell for a long time. Many cars don't have a drain plug on the transmission pan, so the only way to drain it is to pull one side of the pan out. Even when doing this in the shop, it's difficult not to spill the fluid. In some cars, it might tricky to refill the transmission with the new fluid, as many cars now don't have a transmission dipstick. For the same reason it might be difficult to measure the transmission fluid level.